To Kill or Not to Kill Our Whale? The question is moot. The deed has been done. Last week, as a community, we decided to euthanase baby Colin, the whale who had come adrift from her mother, and who had been sucking the hulls of boats moored in Pittwater, one of Sydney’s harbours just a couple sea miles from my house. What a difficult decision – yet I have trust that it will lead to a positive outcome for future orphaned whales. I think situations like this activate some sort of untapped resources in the collective conscience. Just like whale strandings once mobilized differing factions to work together to help the distressed animals, so too, efforts will be made to discover ways to feed and shelter orphaned whale calves. Nature and wildlife photographers have an important role in these unfolding social changes. 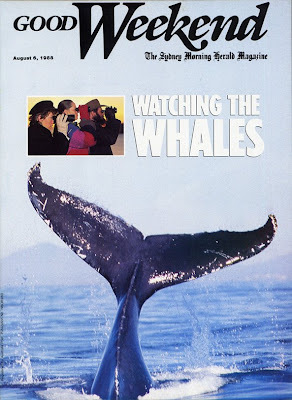 Twenty years ago this whale season, I covered the story of their migration along Australia’s coast, and took some of the first photos of breachings. The front page feature in Good Weekend magazine opened a lot of eyes to the amazing life of whales. Prior to that they were virtually unknown. The story told of their amazing music, their great journey to the Barrier Reef to give birth and their majestic leaps from out of the depths. Now, whale watching is a booming tourism business and once dwindling whale numbers are steadily reversing. Photographers do far more than portray the spirit of nature. They have the potential for influencing the community spirit, that of cooperation, generosity and humanity. Just like beached whales are no longer, I have faith that stories of orphaned whales will have happier endings in the future.